Dog tick right after it was pulled off the dog’s ear. Notice the chunk of dog's skin which is still in the tick’s mouth. 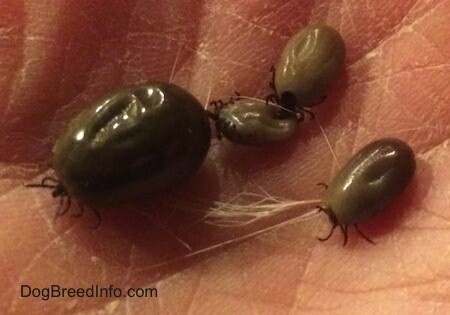 Top: Dog tick full of blood after it has been sucking for a few days. Bottom: Dog tick with an empty belly. Close-up shot of the almost-full dog tick. Notice the skin is still in its mouth after it was pulled off the dog. 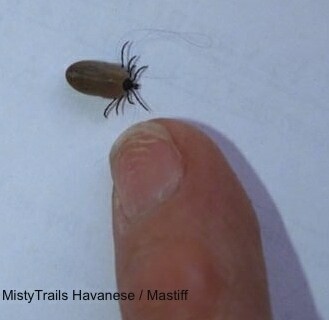 Tick taken off of a dog in BC, Canada—ticks numb the skin and then drink and grow a big blood belly.